Declare the Day contains rich and powerful scriptural declarations that you can proclaim daily over your own spirit, soul, and body and over your life. Declare the Day contains rich and powerful scriptural declarations that you can proclaim daily over your own spirit, soul, and body and over your life. You'll be refreshed, energized and edified as you release the authority and anointing of the Word of God into your atmosphere. 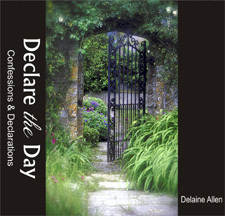 The confessions and declarations are backed by the beautiful, spontaneous and flowing piano of worship musician Melanie Toews. Below, select how you want to receive your copy of "Declare The Day", either a CD shipped to your mailing address which is only $16.00, or a downloadable file which is only $8.00 which immediately after completion of your payment, you can download to your computer and be listening to in only minutes.